Following online accounting courses or programs are an ideal way to stay up to date on the latest developments and learn new insights about accounting. The only problem is that there are a lot of online accounting programs offered and they are all screaming for your attention. So which ones are successful in providing you exactly what you are looking for and how can you find them? As we have done for these other accounting knowledge sources (like Best Accounting Blogs or the Best Accounting Books to read as recommended by accounting professionals), we searched for 50 “Best of List”, selected and combined the 20 most valuable “Best of List” and earmarked and ranked what Online Programs for Accounting keep up appearing in most of these recently published lists. 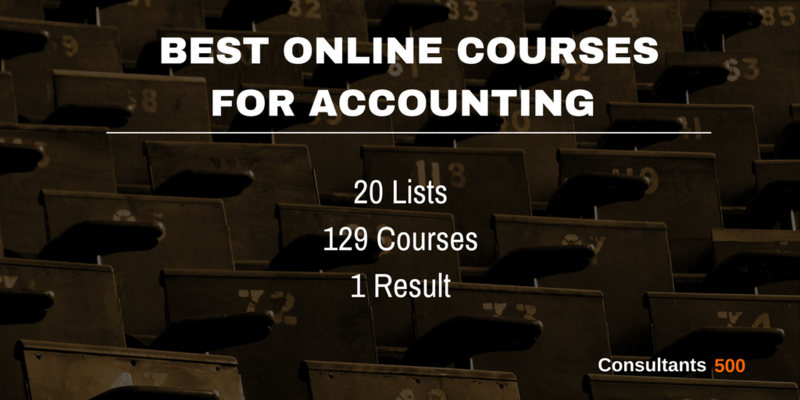 From a total of 129 Online Programs for Accounting reviewed and ranked, here are the top 20 results! Northeastern University College of Professional Studies– Listed 9 out of 20 times, it is the number one online accounting program to consider. Northeastern University offers a fully online B.S. in Finance and Accounting Management, with it’s distinctive professionally minded educational philosophy that includes classes like “writing for professionals” and “business strategy. Their students will not only take courses in key accounting topics, such as auditing and taxation, they will also study finance issues, such as financial reporting, strategic cost analysis, and capital management. They will complete 163 quarter credits over four years of full-time study or seven years of part-time study. Colorado State University Global Campus – Listed 10 out of 20 times, Colorado State University has designed each of their online courses to serve working adults, allowing those who have already earned college credit to finish their degrees, or to earn their master’s. Seventeen accounting credits are included in the 120-credit curriculum and they can also add a specialization one of 18 different areas, including business administration, organizational leadership, and small business and entrepreneurship. Classes are offered in eight-week blocks throughout the year that allow them to adjust the course load as needed. Penn State University World Campus – Listed 8 out of 20 times, Penn State’s online Bachelor of Science in Accounting delivered by World Campus is one of only a few AACSB–accredited programs available online, an honor reserved for the top 5% of business schools worldwide. Penn State University World Campus offers a fully online B.S. in Business with an Accounting option. Core requirements may be transferred in, making it easier than ever to obtain an affordable degree from a world-class institution. University of Alabama – Birmingham – Listed 13 out of 20 times, UAB traces its roots to the 1859 founding of the Medical College of Alabama and the 1936 opening of the Birmingham Extension Center of The University of Alabama. University of Alabama Birmingham’s eLearning Division capitalizes on new technology to provide engaging, collaborative online courses. One degree available to 100 percent online is the Bachelor of Science in Accounting. Over four years full-time or longer part-time, online undergraduates learn from award-winning faculty to earn the Certified Management Accountant (CMA) designation. Washington State University – Listed 12 out of 20 times, WSU’s Global Campus offers its students to select one of several minors to supplement their studies in accountancy. The degree places focus on business principles, strategy, tax law, and auditing. This rigorous accounting program stands apart from other online accounting degrees in that all students must become certified in business administration with a concentration in accounting prior to advancing to upper-division business and accounting courses. Online students attending Washington State University’s Global Campus can prepare for the in-demand financial services sector through the Bachelor of Arts in Business Administration with an Accounting Concentration. Auburn University, Alabama – Listed 9 out of 20 times. The online accounting program at Auburn University is highly rated in terms of both quality and affordability and is accredited by the AACSB. Auburn’s online Accounting degree is actually a B.S. in Business Administration with a focus in Accountancy but still functions to prepare students for the CPA exam and accounting roles in the work world. The B.S.B.A. in Accountancy is the first online undergraduate degree offered by Auburn, and offers live streams and recorded videos of lectures from the traditional program. University of Massachusetts Amherst – Listed 7 out of 20 times. Amherst’s online accounting degree will engage students in the major areas of the discipline, such as financial reporting, information systems, and taxation, which prepares them for many different accounting disciplines. It will open doors to careers as auditors, bank examiners, and treasurers. The program is also only one of a handful in New England that has a separate AACSB accreditation. The major consists of general education requirements, the school’s own Isenberg core courses, accounting course requirements, and 21 credits of non-business related courses. Clarion University of Pennsylvania – Listed 6 out of 20 times. Clarion’s Bachelor’s degree in Accounting has been ranked in the category of Best Online Program by Bestcollege.com in 2015. Their online programs include associate, bachelor’s, graduate and doctorate degrees as well as certificate and special programs. The school offers a Bachelor of Science in Business Administration/Accounting (B.S.B.A.) for students wishing to succeed in accounting and finance. Although Clarion’s program is only available part-time, many working adults actually prefer to take just one or two classes per semester. For these students, Clarion’s online program provides a convenient option and a thorough education in both business and accounting. Old Dominion University – Listed 8 out of 20 times, Old Dominion University has been recognized by multiple sources for the caliber of its online accounting program. In fact, both College Factual and College Choice named it one of the best online colleges for accounting in 2016-2017. The majority of faculty that teach Old Dominion online courses have a doctorate or terminal degree and also teach on-campus courses and students. Students, admitted to the online accounting degree program, can also combine the accounting major with either a second major or a minor from subjects across the university. University of Maryland — University College – Listed 8 out of 20 times. Students enrolled at the University of Maryland – University College can earn a Bachelor of Science in Accounting through distance learning. UMUC offers the best of both worlds—a convenient online education from a respected state university. For more than 65 years, UMUC has provided educational opportunities to students around the world, earning the university a global reputation for excellence. Today, UMUC educates more than 80,000 students. The curriculum, consisting of a total 120 credits, is comprised of courses in statistics, economics, cost accounting, income taxation, business law, and auditing. Indiana Wesleyan University – Listed 10 out of 20 times, offers several online programs that are specifically geared toward adult learners, including an accredited online accounting degree Bachelor of Science in Accounting degree. The program prepares students for managerial positions in business settings, and can also be completed in about 20 months of study. This program, which is designed for working professionals, emphasizes accounting theory, taxation, and auditing. And the broad-based curriculum provides the skills and knowledge necessary for a career within the general field of accounting. Regis University, Denver – Listed 6 out of 20 times. Regis University is one of the 28 Jesuit colleges and universities in the United States, which share the Jesuit vision of a values-centered education that shapes intelligent decision-making and strengthens commitment to community service. Offered both online and on-campus, the B.S. in Accounting degree equips you with analytical and quantitative skills that can be directly applied within the private and public sector, whether you are a sole practitioner, serve a small practice or lead within a multinational firm. Keiser University, Florida – Listed 5 out of 20 times. This online accounting degree teaches students foundational concepts in the discipline alongside vital strengths for the modern workplace, such as communication skills. 120 credit hours are needed for students to obtain a bachelor’s in accounting. 51 of the credit hours are spent in upper division accounting major courses like auditing, intermediate accounting, and principles of managerial finance. Distance learners can utilize the Department of Student Services for help developing professional skills, such as writing a resume and mastering the job interview. Keiser’s BA in Accounting can be completed online in four years. Southern New Hampshire University – Listed 9 out of 20 times, this university offers a fully online B.S. in Accounting with four specializations, including a BS in Forensic Accounting & Fraud Examination, a BS in Accounting focusing on Finance, a B.S. in Accounting centering on Information Systems, a B.S. accounting degree looking at business studies, and an accelerated BS to MS accounting degree. The SNHU online Bachelor of Science in Accounting program teaches students a deep knowledge of accounting practices, supplemented by the broader, business-specific skills employers look for. Liberty University, Lynchburg – Listed 7 out of 20 times. Liberty is the largest Christian university in the world. The school serves 90,000 distance learners and offers nearly 300 web-based programs, including a bachelor’s degree in accounting. Liberty’s online accounting degree covers the basic foundations of the discipline while integrating Christian ethics into the curriculum. This course offers a fully online accounting degree (B.S.) that requires a total of 120 credit hours, only 30 of which must be taken at Liberty (the rest may be transferred). University of Memphis: Online BBA Accountancy – Listed 5 out of 20 times, offers an online, AACSB-accredited Bachelor of Business Administration with a major in Accounting. The degree program focuses on accounting within organizations, technological competency, critical thinking, effective communication ethics, and decision making. The interdisciplinary online accounting degree provides students with a sound foundation in ethical business practices within a global context and, like all online degrees at the University of Memphis, it can be completed entirely online or can be combined with on-campus courses. University of Minnesota — Crookston – Listed 8 out of 20 times. The University of Minnesota-Crookston offers an online Bachelors of Accounting that caters to students wanting a program that has small class sizes that still prepare students for examinations and certifications through the campus to become a Certified Public Accountant, Certified Management Accountant, or a Certified Internal Auditor. The program places an emphasis on accounting principles for profit, public, and non-profit organizations while using problem-solving strategies. This flexible program teaches students the fundamental and advanced techniques needed to assist future clients and firms with financial reports. Florida Atlantic University – Listed 6 out of 20 times. Florida Atlantic University offers the upper-level courses for its Bachelor of Business Administration in Accounting fully online. Online accounting degree students at FAU can expect a rigorous course load. In order to advance to the upper-level classes in the major, participants must first pass an Accounting Competency Exam. The school also supports a unique Accounting Scholars Program for high-achieving students. Graduates of this program enjoy extremely high job placement rates, and more than 90% go on to careers in public accounting. Western Governors University – Listed 5 out of 20 times, is our final university in the top 20 list. The principal mission of Western Governors University is to improve quality and expand access to post-secondary educational opportunities by providing a means for individuals to learn independent of time or place and to earn competency-based degrees. WGU offers an undergraduate accounting degree online for those students who wish to solidify their knowledge and skills in financial and cost accounting, tax accounting, auditing, and other accounting areas. Accounting is often ranked as one of the most desirable professions available—including being ranked as one of the top 25 jobs in 2016 by U.S. News & World Report. In general, accounting jobs are in high demand no matter what the current state of the economy is. Hoovers places annual revenue in the public accounting industry at $125 billion, and with rising interest in emerging specialties such as international accounting, investigative and forensic accounting, and environmental accounting, the industry promises to remain dynamic and rewarding for years to come. Nevertheless, employers will be seeking to hire the best and brightest, and competition for top jobs can be regarded as fierce. There are many different positions you can find in the accounting field. Careers in accounting can range from entry-level positions to executive level and can cover fields like Forensic Accounting, Management Accounting, Public Accounting, Auditing and Financial Accounting. Further detailed information about career opportunities in accounting can be found here. Want to know what salaries are for typical accounting professions, just check our overview of the Best Annual Salary Surveys for the Accounting Professional. Our Blog focuses on helping you to find the best sources on the web about Accounting. Think of blogs, books, tools, software, online courses, firm rankings, universities and much more, all related to Accounting. It also includes guest posts from our users or visitors about all sorts of accounting topics. Via our Accounting Community Forum, Professionals and Clients can share knowledge by having Q&A conversations about typical business issues or best practices in relation to Accounting. Here you can share your Accounting Knowledge, rank answers by how valuable they are, or just read and follow any Accounting topic you want, and get noticed when new contributions are made to discussions you follow. Want to share your favorite Accounting Resources? Just complete our online survey in less than a minute, we do not ask for your email and you can skip or answer any question you like. We will include your suggestions in one of our Best Accounting Resources Shortlists if we also like it. Then via Accounting Knowledge Resources, you can quickly find the best Accounting Resources on the web as suggested by our users and visitors via the above online survey. Think of blogs, books, learning, online courses, cheat sheets, university rankings, firm rankings, salary surveys, tools, industry reports and much more, all related to Accounting. We prepare a base list of Accounting Resources and then this list is continuously updated basis tips received from our users and visitors. More than 75% of potential Clients who look for Accounting Services start a Web Search to find the best Accounting Pro for the Job. Because the internet is by far the leading channel, it is critical that your business can be easily found on the internet. Creating a profile on our Platform is free and opens the door to new opportunities, it can be done in only a few minutes and without any credit card. Easily find and compare highly qualified Accounting Pros by searching our Platform, which can be Accounting Firms, Accounting Professionals, or Accounting Freelancers. Directly contact and work with your ideal candidate in any way you like. Searching is always free, and that also means that we never charge any transaction type of fees. We made a list of 50 posts that we recently published about “Best Online Accounting Programs” to follow. We combined the 20 lists about “Best Online Accounting Programs” and earmarked all individual blogs that were on those lists. More weight was assigned to blogs who where clearly listed more times than other blogs. This resulted in the final “Top 20 Online Accounting Programs” that are recognized by many different sources.